Apple Tree Medical Centre offers a comprehensive list of medical services to the York University community. The CHR receives and processes human rights concerns and complaints brought forward by York students, faculty, and staff. The CHR responds to York student, faculty, and staff inquiries, concerns and complaints relating to breaches of provincial human rights legislation and/or York human rights policies and procedures. York University has a procedure for dealing with complaints of harassment or discrimination that our team follows. The AWC offers a variety of services for Glendon students. These services include personal counselling and accessibility services for students with learning disability, mental health disability or physical, sensory and medical disability. To schedule a consultation, please visit the Wellness Consultations page. 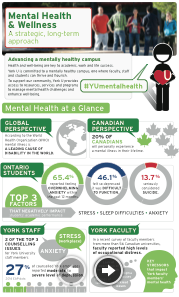 Health Education and Promotion is a team of York students and staff that collaboratively work with on and off campus stakeholders to create a community that supports students’ health and well-being. We provide outreach, workshops and one-on-one peer support for students with regards to mental health, sexual health, alcohol and other drugs and nutrition, all from a harm reduction approach. Learning Skills Specialists are available to assist students who would like to find strategies to manage their time more effectively, stay on top of their studies, prevent problems later on in the term, and get the most out of their university experience. The Office of Student Community Relations (OSCR) supports students impacted by critical incidents, facing personal crises or multiple complex issues. OSCR supports students, parent/guardians and the community in its role as the University liaison in the management of critical incident cases. OSCR works with students to resolve complaints regarding inappropriate student behaviour either informally or through formal disciplinary processes. To register with SAS, students must be enrolled in degree-granting programs on the Keele campus of York University. As part of registration, students must provide BOTH their disability related documentation AND complete an online questionnaire. 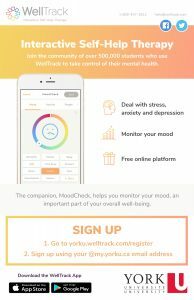 This unit helps York students to realize, develop and fulfill their personal potential in order to maximally benefit from their university experience and manage the challenges of university life. Students come to SCD because of a wide range of concerns including, but not limited to: depression, anxiety, abuse, stress, self-esteem, relationship issues, eating and body image as well as issues related to sexuality, short-term individual, couple, and group counselling, crisis intervention and consultations regarding students in distress/crisis and issues related to overall mental health. SASSL provides unbiased and non-judgmental peer support and referrals to survivors of sexual violence. Educational outreach programs and information sessions are offered. The Centre for Sexual Violence Response, Support & Education (The Centre) coordinates supports and resources for all members of the community that have experienced sexual violence, receives disclosures and complaints, facilitates safety planning, and assists survivors through the complaint process.